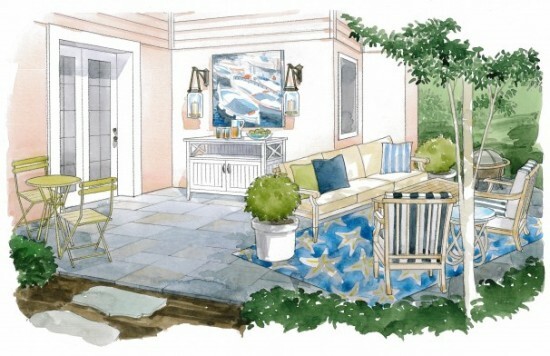 I had the pleasure of designing a patio space for The Washington Post’s House Calls feature last week. This is essentially a virtual or e-deisgn, meaning the space is designed via email only with no in-person visits. The homeowner submits a space in need of design help to The Post and The Post pairs that space with a designer who creates a design to fit the homeowner’s needs and budget. A space plan is created and the furnishings and accessories are selected and presented to a talented illustrator who draws a picture of the completed space. And tada — a new space is born! You can see links to all of the selections and my design tips on The Post’s website. Here’s a peek behind the process I went through to create the design solution for this patio. I received this email from the homeowner, outlining how she will use the patio (shown above, as is now). In another note she requested a nod to a coastal look for this space so I used that as my inspiration for the colors and selections. The homeowner set a budget and The Post requests that all selections are available via retail sources (versus designer exclusive sources). First things first, a space plan is always needed! Once a space plan is in place I begin selecting items to fill the space! Each item receives a corresponding number and a selection list is put together with links to each item. This is what the illustrator works with to draw the space and what The Post publishes for sources. Here’s an overview of the selections that fill this space. The colors palette consists of blues and greens and lots of great texture to nod to the coastal feeling desired. Mixing various blues and patterns on the rug and cushions adds a lot of great visual interest to this cozy patio space. I was happy to receive the following email from the homeowner after she saw the design in print. Sounds like a success! If you are interested in a virtual design from AFP Interiors please contact me to learn more about the process and how I can help you create a design you can implement on your own. Welcome mats to make you smile!